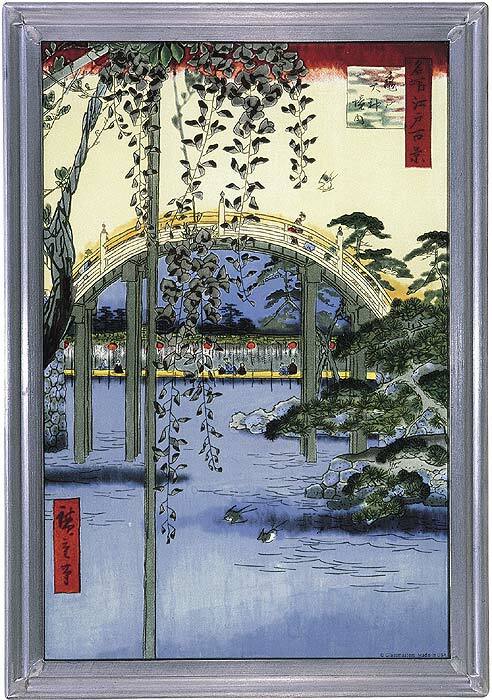 Dimensions: 6 7/8" x 10"
Inside Kameido Tenjin Shrine is a reprint from the celebrated series "100 Famous Views of Edo" and depicts the wisteria blossoms and arched bridge of the famous Kameido Tenjin Shrine on the eastern fringe of Edo (present-day Tokyo). Designed by the 19th century Japanese artist, Ando Hiroshige (1797-1858), this woodblock print represents a detailed close-up view of a flower commonly associated with summer in Japan. The stained glass panel was inspired by this well-known image, now on display at the Brooklyn Museum of Art.